Samsung - Multipurpose sensor - wireless - ZigBee 3.0 - whiteSamsung's SmartThings Multipurpose Sensor serves, you guessed it, Multiple Purposes. It is great for monitoring windows, doors, drawers, or any off-limits space. You can also set it up to control SmartThings Compatible Products. This sensor comes in really handy, especially when trying to make sure junior stays out of the cabinet under the kitchen sink. Requires a SmartThings Hub or compatible device with SmartThings Hub functionality. Samsung's SmartThings Multipurpose Sensor serves, you guessed it, Multiple Purposes. It is great for monitoring windows, doors, drawers, or any off-limits space. You can also set it up to control SmartThings Compatible Products. This sensor comes in really handy, especially when trying to make sure junior stays out of the cabinet under the kitchen sink. 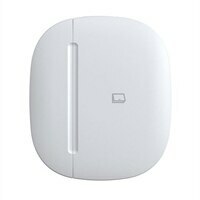 Requires a SmartThings Hub or compatible device with SmartThings Hub functionality.